Our cozy boutique is bursting with unexpected arrangements, exotic orchids, textural succulent planters and ready-to-go gifts in all price ranges.Special Moments Flowers & Gifts is an independent 20 year family owned floral and gift shop dedicated to providing the most beautiful, fresh and unique floral creations from North Vancouver. Jennifer, the owner, personally selects premium quality floral specimens and plants from local and international growers. Jennifer also selects tastefully chosen giftware from North America and International suppliers. These include paraben free and vegan candles, room diffusers, luxuriously fragranced soaps and lotions, jewelry, cards, vases and more. Our floral work has been showcased in prestigious wedding publications such as Ruffled, Magnolia Rouge, Style Me Pretty and Real Weddings. We offer a full range of floral services including local and international delivery. 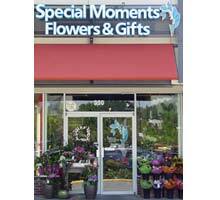 We also accept on line orders at www.smflowers.net. Experience it for yourself! To help assure on-time delivery during the busy holiday season, place your order at least 1 day prior to the following major holidays: Thanksgiving Day, Christmas Day, Boxing Day, New Year's Day, Valentine's Day, Easter, Father's Day , Labor Day, Canada Day, Good Friday, Remembrance Day, B.C. Day and Victoria Day. Our shop will always be closed on the following holidays: New Year's Day, Victoria Day, Canada Day, BC Day, Christmas Day, Boxing Day. Our shop serves the following areas: Burnaby, Coquitlam, North Vancouver, West Vancouver (up to the 4000 block) West Vancouver (Horseshoe Bay), Port Moody, Richmond, New Westminster, West Vancouver (HWY 99), Surrey, White Rock, Vancouver, Port Coquitlam, Delta, Lion's Bay, Pitt Meadows, Langley, Maple Ridge.